On an April afternoon, we headed for a little exploration of a neighbourhood close by my place of work. The hot sweltering sun was no deterrent to kindred souls who wanted to have a closer glimpse of nearby places that were tucked up in lanes and by-lanes and offered vignettes of the past. 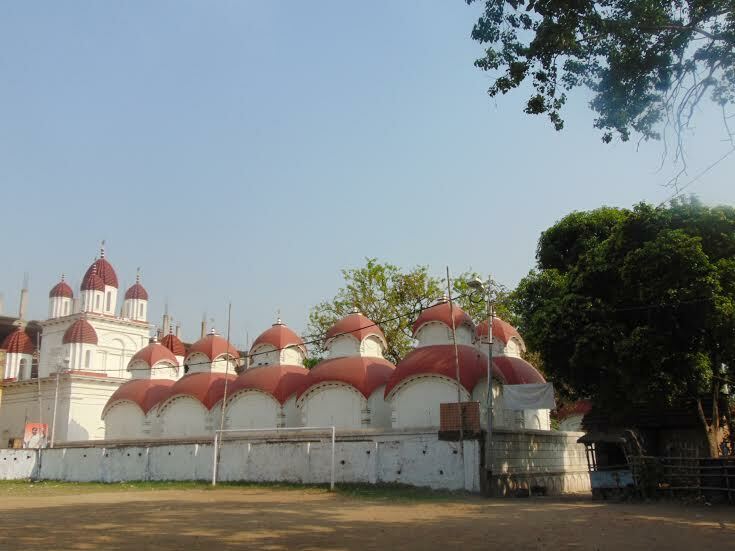 Baranagar – possibly originating from Barahanagar, ‘baraha’ meaning pig and ‘nagar’ town – is a municipality on the northern fringes of Kolkata, the capital of West Bengal, India. 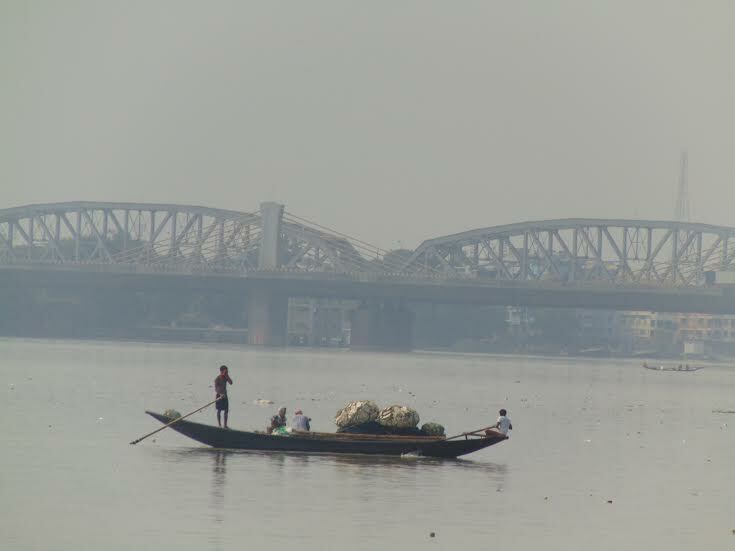 Located on the eastern bank of the river, Hooghly, Baranagar is older than the city of Calcutta. Having grown up close by, many of the streets were familiar to me. But I was unprepared for what the place had to offer. 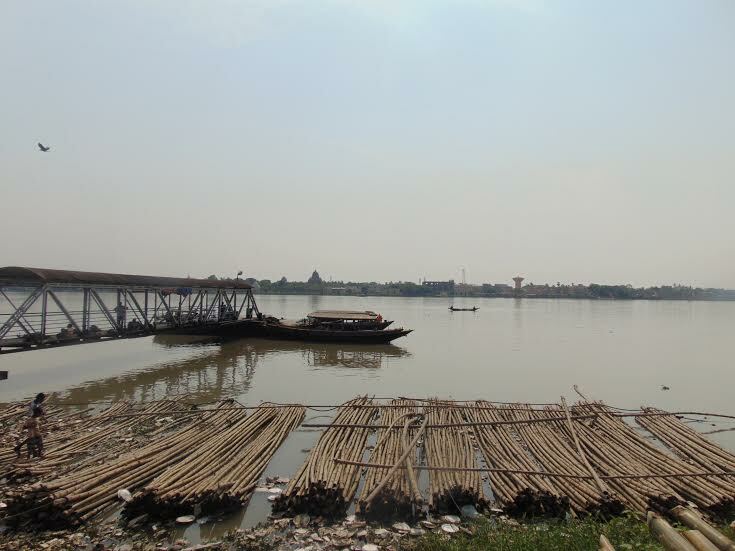 Our destination was Kutighat, a small ghat on the banks of the river, Hooghly, in Baranagar. Kutighat has a small jetty with a launch service that ferries across the river, twice a day. As we trudged across the jetty, a sense of languidness prevailed – people sleeping on the jetty sheltered from the blazing sun, a few small boats plying their work, bamboo let out to dry on the banks of the river, two young college girls enjoying the feel of the place, much like us, fishing nets lying on the jetty and, in the distance, on the other side of the river, stood Belur Math, the headquarters of the Ramakrishna Mission. The jetty also offered us a wonderful view of the Bally Bridge in the distance. As we climbed down the ghat, we got to see familiar sights that could be found on any ghat along the banks of the river – people carrying on their daily activities, not much bothered by our presence. Almost opposite to the ghat is a school that dates to 1886. 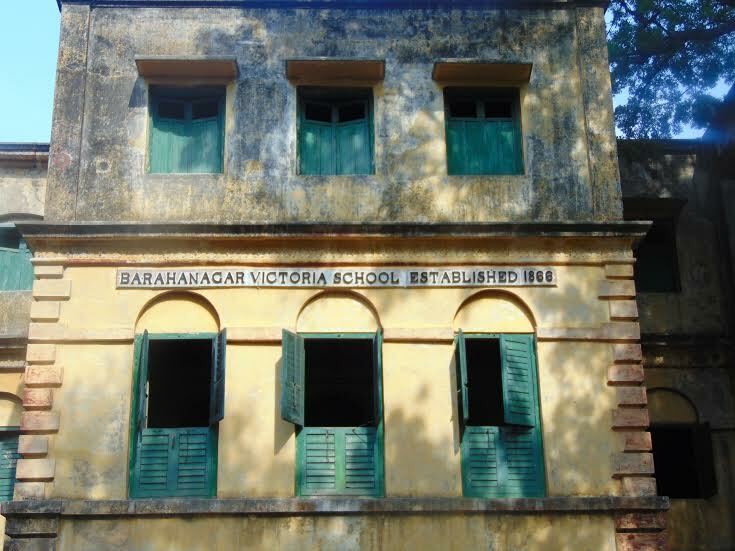 The Barahanagar Victoria School is not functional now, but its huge buildings and compound stand testimony to its heyday. A Dutch Kuthi (house) stood a little distance away from the school and the ghat. All that remains of that house today is thick foliage. Some years ago the original Dutch Kuthi was pulled down to make way for a high-rise. The Dutch had homes in this area in the seventeenth century. Streynsham Master, who visited the area in 1676, spoke of a hog factory where about 3,000 hogs were slaughtered each year and salted for export. Later it became the centre for the jute trade. Before the house was demolished, there existed a plaque on the wall which identified the house as Dutch Kuthi. However, locals were aware of the Dutch heritage and even small school boys playing cricket on the street could point us to the Dutch Kuthi when we asked them about it. As we moved to the north leaving behind the Dutch Kuthi and Kutighat, we found the Joy Mitra Kali Bari, a temple dedicated to the goddess Kali. The temple had a fresh coat of paint. Built in 1850 by Joy Chandra Mitra, the temple stood on an erstwhile Dutch cemetery. The main temple was dedicated to the goddess, Kali, and twelve temples were dedicated to her consort, Lord Shiva. The Goddess is referred to as Kripamoyee, ‘one full of mercy’ and the idols are carved from a single stone. It is believed that Rani Rashmoni built the famous Kali temple at Dakshineshwar six years later and modelled it on the Joy Mitra Kali Bari. We surge ahead northwards, past huge old houses, most of them in a dilapidated state, many with foliage growing on their walls, and some were repaired here and there. 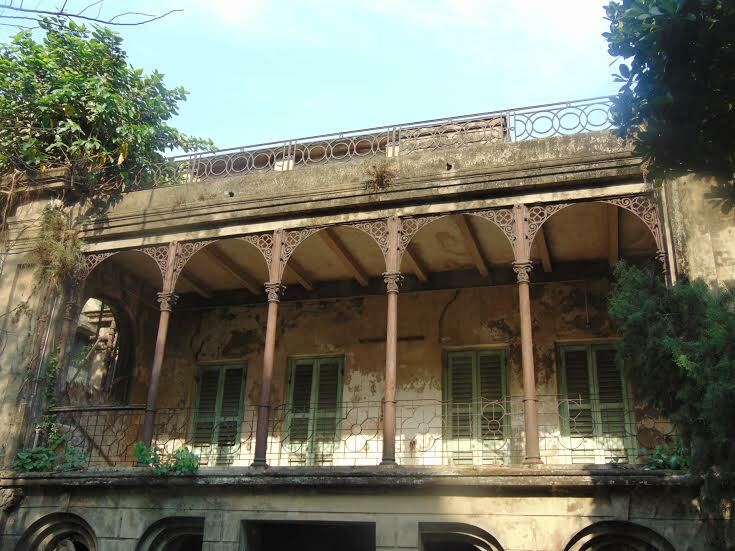 Some of the houses had a raised platform in front them – the famous ‘rock’ so very familiar in many houses of north Kolkata. These platforms, the ‘rock’, are the place where friends, neighbours and locals gathered to engage in a friendly banter. Close by is the Kaancher Mandir or the Glass Temple. 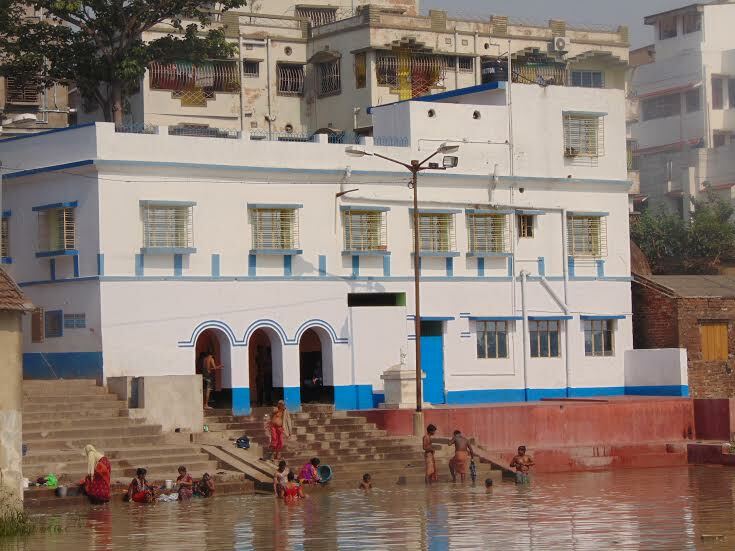 This temple, on the banks of the river Hooghly, is now managed by the Ramkrishna Mission. 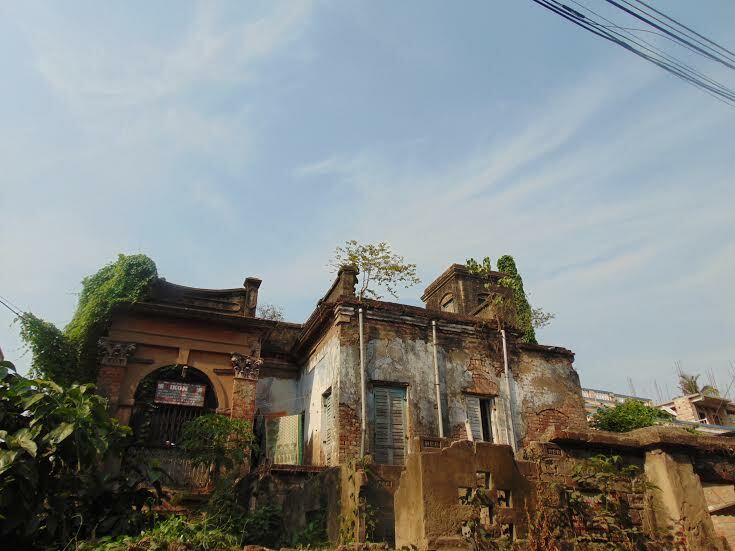 Just opposite the temple is an old house in a dilapidated condition. There is a lone caretaker and a few squatters around. 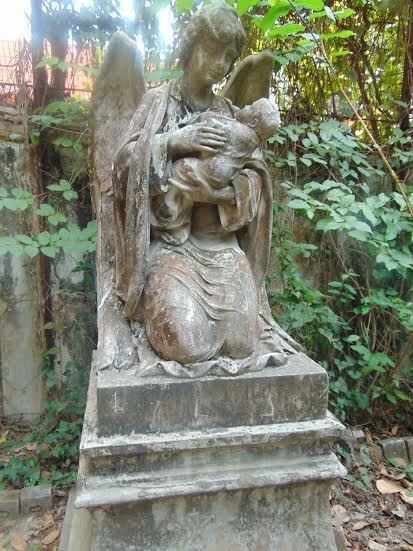 As we entered, we saw a statue of an angel holding a baby in the garden and a huge marble seat. We sat for a while on the seat and looked up at the house. What struck us was the huge balcony which surely must have afforded wonderful views of the river flowing by. As we negotiated the lanes and moved up north, we found Pathbari. 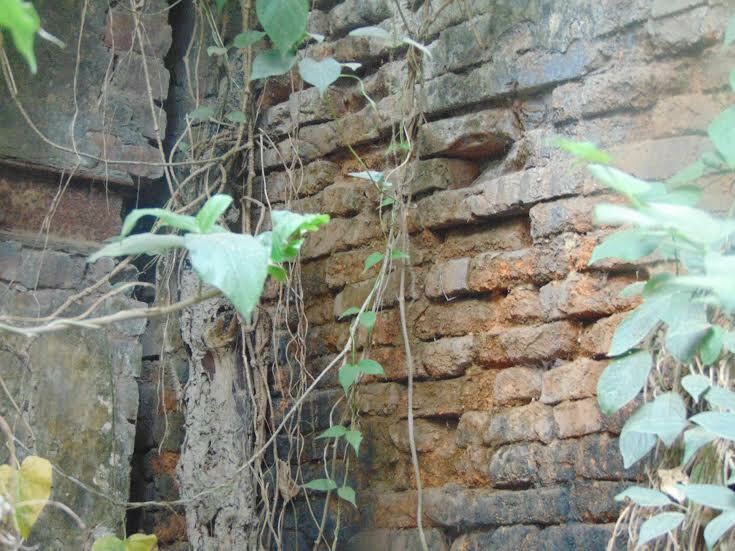 This happens to be the place where Sri Chaitanya Mahaprabhu stopped on his way to Nilachal Dham about five hundred years ago. 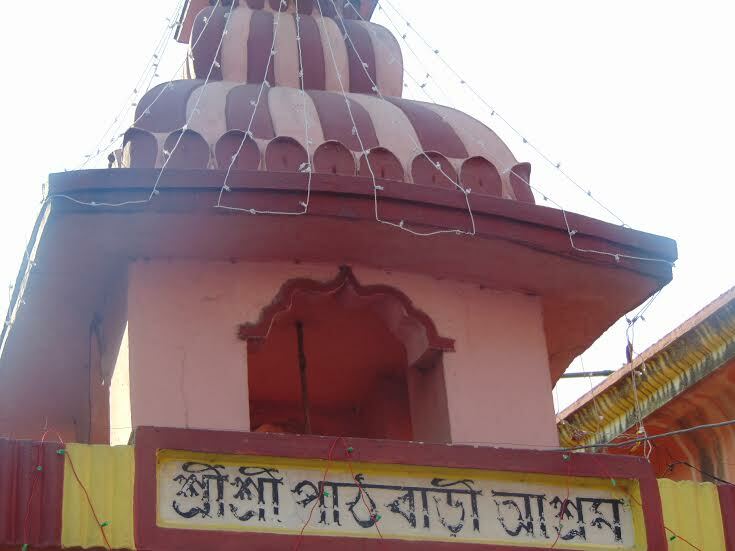 Legend has it that Chaitanya Mahaprabhu came here to listen to the chanting (‘path’) of the Hindu scriptures and hence the name.The footwear that was supposed to have belonged to the seer is worshipped at Pathbari even today. It houses a library that is a treasure trove for knowledge on Vaisnavism and includes almost all the original manuscripts of Chaitanya Mahaprabhu’s early disciples. We leave with fond memories of the place – the many ghats dotting the Hooghly, people at their daily activities, the river so much a part of their lives, children playing cricket in the lanes, old houses, derelict and dilapidated, trees growing from columns that once stood grandly, temples, a school that is empty now, broken walls – all testimony to what once was. The place has moved on, older houses have been pulled down wherever possible and multi-storeyed apartments have come up in their place. The ones that have been spared are the ones that are involved in court cases. The Dutch Kuthi is gone. What remains are the outer walls and dense foliage all over the place. Only that tree, with its roots embedded deep into the walls, stands testimony to its former glory. Read the latest issue of Cafe Dissensus Magazine on ‘JNU and Its Tradition(s) of Dissent’, edited by Malavika Binny, JNU, Delhi, India. 4 Four years have passed since this my request was made to KMC and the result is that a historical place in Baranagar was completely destroyed. Now you can build your stupid shoppings and forget your own History thanks to Kolkata Municipal Corporation. By the way, Kuthi Ghat borrowed his name from this Dutch Kuthi that now is no more.